Hiding a phishing campaign can be useful for Scam of the Week, Security Hints and Tips, or any test campaigns you have running to avoid skewing your phish-prone results. Navigate to the Phishing tab. 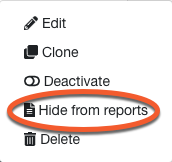 Check the Hide this campaign from reports box during your campaign setup. Navigate to Phishing tab > Campaigns. Click the drop-down to the right of the phishing campaign you'd like to hide. You can also unhide the campaign if you change your mind in the future by following the same steps.